Apologies for the title of this post but none other is really appropriate. Alyce has been very much into artwork lately. So much so that we got a note from her teacher saying how good she was at art and that it was her favorite subject. 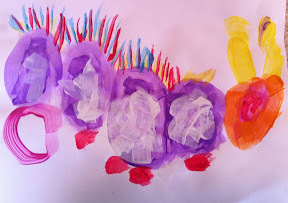 A few days ago as I was leaving to go to work Mom and Alyce were busy painting a picture of a caterpillar that was sitting in front of them. That night after I got home, during dinner, I asked her how her caterpillar turned out. She ran and got it for me off of the refrigerator. Her recreation of the subject was impressive. I'd call it watercolor impressionism. I noticed one extra circle on the backend of the caterpillar. 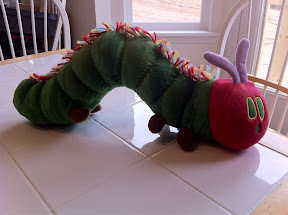 Talking to Mom earlier I knew that Alyce had run out of room to put a head on the caterpillar and that she gave up and put it on the other side leaving half a head on the bug's rear end. I asked Alyce what each part of the caterpillar was. She showed me the head and the body. When I pointed to the blob at the rear Alyce said without missing a beat "that's poop!". Mom and I just howled! Alyce and Luke looked on not knowing what was so funny. 0 comments on "That's Poop"